There is a need to improve rapid response teams and code blue activations. 50% of Code Blue events involve patients receiving opioids. Moreover, unrecognized postoperative respiratory failure that results in cardiopulmonary arrest is a daily occurrence at healthcare facilities across the United States. In a recent interview with the Physician-Patient Alliance for Health & Safety (PPAHS), Eyal Zimlichman, M.D., MSc., spoke at length about improving rapid response teams and code blue activations. So by the time of intervention between one vital sign check to the other, we actually would get to the patient bedside only when he goes into cardiac arrest. If that deterioration occurs. So being able to continuously monitor patients on general floors, much like we do on ICUs, could be something that would make a significant contribution to preventing these preventable deaths inside hospitals. [Using the continuous monitoring system in our research] there’s a 50% chance that [when the alarm sounds] this patient would need an ICU. When the nurse gets that alert on top of her clinical judgement, it reinforces her decision making and I think that factor alone contributes to a better and efficient activation of the system. To listen to the complete interview with Dr. Zimlichman, please click here. For another interview with a clinician who has been able to reduce the need for rapid response activations by more than 50%, please click here. 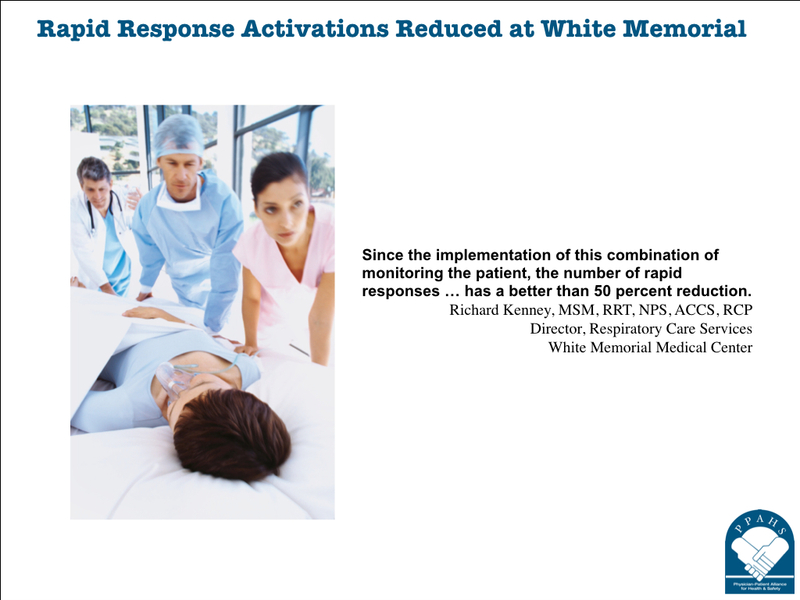 White Memorial Medical Center in Los Angeles has experienced a âbetter than fifty percent reduction in calls of rapid responsesâ, according to Richard Kenney, MSM, RRT, NPS, ACCS, RCP (Director, Respiratory Care Services, White Memorial Medical Center). To better understand what Adventist Health hospitals have done to reduce rapid response calls and improve patient safety and health outcomes, the Physician-Patient Alliance for Health & Safety (PPAHS) interviewed Mr. Kenney. In this interview titled, âAvoiding Respiratory Depression During Conscious Sedationâ, Mr. Kenney says using capnography monitoring has reduced rapid response calls by more than 50%. The combination of the two allows us to cover, if you will, our bases, meaning that we can monitor the respiratory rate, the heart rate and cases of the pulse oximetry it gives us a better reading knowing that their profusion status is good. What I think is even better today than just a few years ago, is that the end tidal CO2 device and the pulse oximetry were two separate machines that took up a lot of space on the patient’s bedside table with long cables running all over the place but, with today’s devices that we’re currently using have the pulse oximetry and the end tidal CO2 in one device. They have a built in algorithm rhythms that will let the respiratory therapist or the nurse taking care of that patient, give them the advantage of knowing that something is starting to happen with this patient because these two parameters are not matching in a way that they should, and you need to come in and evaluate your patient. And so because of that, we can intervene much quicker for patient safety than we did in the past; so the combination of being able to monitor both oxygen and ventilatory status is a win-win for the patient. since the implementation of this combination of monitoring the patient, the number of rapid responses to those areas where the patient comes out with that PCA pump have – I want to say – a better than fifty percent reduction in calls of rapid responses. On YouTube â please click here. At iTunes â please click here. To read a transcript of the interview, please click here. Copyright © 2019 Respiratory Compromise Institute. All Rights Reserved.